Over the past decade, DARIUSTWIN has worked alongside a variety of clients in creating cutting edge campaigns and our portfolio of clients only continues to grow. Below are a few of the larger brands that we are proud to have worked with in the past. DARIUSTWIN worked with fellow light-painting photographers Jason D. Page and Efren Herrera to concept & create one-of-a-kind light-painting portraits for artists Janelle Monáe, Marshmellow, Maddie Poppe, Meghan Trainor, Miguel, Shawn Mendes, Sabrina Carpenter, Ryan Seacrest, Jack&Jack, The Backstreet Boys, and more - live and on location during an event at the Banc of California Stadium in downtown Los Angeles. DARIUSTWIN had a little cameo with some dancing light-figures for a band called 'The Internet' in their track 'Roll (Burbank Funk)' off their album out 7/20/18 called 'HIVE MIND', directed by Joe Weil & produced by Sam Canter for the production company 'Psycho Films'. A light-inspired video project for Brisk (Pepsi Co.) featuring b-boying from RJ Puno, BMX tricks from Kris Fox, streetball moves from Mosquito, and light paintings from yours truly, streetwear styling by Rob Garcia, and OpTic gamer Hector Rodriguez. At the Apple Store on Third Street Promenade in Santa Monica, CA DARIUSTWIN gave a presentation and workshop focusing on light-painting photography. DT also demonstrated how users could light-paint using a long-exposure App (called NightCap Pro ) with the cameras on their iPhones. 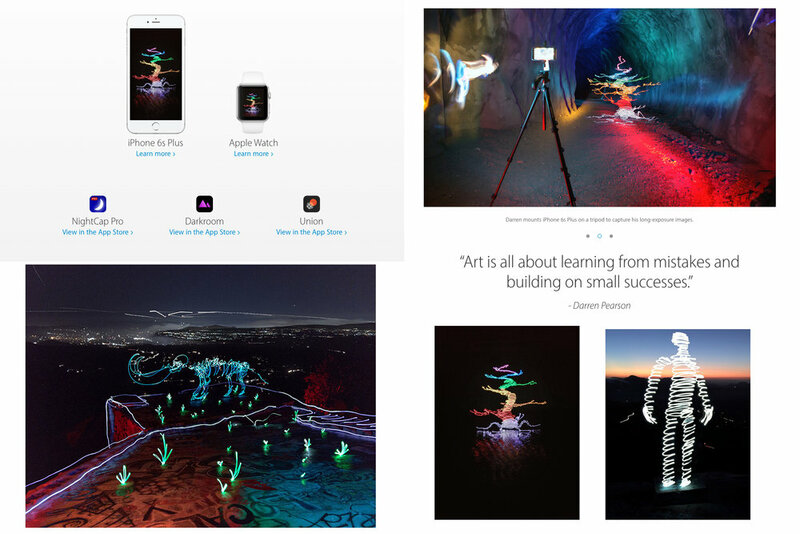 This was after DT light-art was featured on their in-store print displays around the globe. LAFC had a light-painting photo booth where participants 'earned their wings'. Around 100 long exposure photos taken that night with groups of up to 10 people in the tent at a time. Each photo took about 15-60 seconds to create depending on how many in the group. It was a great crowd! Astrobandit and DARIUSTWIN did a little road-trip up the California coast with some of the coolest West-Coast camping gear ever. Los Angeles NHM invited DARIUSTWIN for a short lecture on light-painting photography. Afterwards, I took some light-painted dinosaur requests for the audience. Telling my first volunteer, "Point the LED light towards the lens of the camera". After taking a request for a Mammoth skeleton. Explaining the basics of Light-painting. My volunteer's first-try creation - a very ambitious Jurassic Park logo! After taking another audience request for a Raptor skeleton. A racetrack decked out with LED lights combined with souped-up LED cars and a few action-sport stars.. What could possibly go wrong? Promotion of Reebok Classic Lite shoes with light-art media along with two other light-painting legends Vicki DaSilva and TCB.